Remember when your parents first took the stabilizers off your bike and let go? The moment of fear, then the exhilaration when you could ride on your own. Creating your website can feel like you are preparing for a fall when you put yourself out there on the internet. However, there are some tricks you can use to conquer those inner doubts and drive yourself forward. Rather than ignoring your concerns, make sure you acknowledge them and question the underlying assumption behind the fear. Maybe your inner voice is telling you that “building a website is too hard”, even though this doesn’t have to be the case. We have some tricks to help you out and get you on track! I spoke to some of the experts in our team to gather the techniques that work for us here at Jimdo. One of the traps people fall into is thinking that they want to appeal to everyone, so end up appealing to no one. Grabbing the attention of the viewer that you want is vital with so many other websites out there competing for interest. The type of viewer you want to attract will also affect the design of your website. If you’re looking to sell ties to businessmen, you may want to opt for a more conservative layout, like this men’s watch website. Who is your website’s target audience? It can be scary not knowing where to start, with so much information out there and your inner cynic telling you that it’s too much work. But the good news is that there are so many tools and apps out there to help. I really like Lifetick to help stay on track with making SMART goals (see below) for the week. Plus it syncs with your own calendar so you can coordinate your goals around your schedule. Attainable: Attainable goals motivate you to achieve. Is 5% growth attainable? Do you have the staff/stock or resources to achieve this goal? While it’s always good to aim high, the goal will be more meaningful if it’s based in reality. Relevant: Does this goal actually matter in the grand scheme of things, and is this the right time to aim for it? For example, maybe you’re focusing on developing your product right now, and growth would actually be a better goal for later. Just like climbing a mountain, the only way to make progress is by taking it one step at a time. Try to focus on small goals that support each other for a long term result. Then make sure that these goals are achievable within the set time-frame. For example, weekly goals should be able to be accomplished within the week. According to Harvard psychologist Amy Cuddy, the biggest mistake that leads people to fail is focusing on the outcome, not journey. Think of your website as an experiment, not a finished product, that you can continuously improve. By changing your mindset away from “nothing is happening” to thinking of your website as an ongoing learning opportunity, you get rid of the unattainable expectations we all set ourselves. Your website is part of a journey to a goal that you are trying to reach, so keep in mind it won’t be amazing straight away. This should be an enjoyable experience that will lead you to your dream goals! The reward system is ingrained in our psyche from a young age, like getting a trophy for winning the three-legged race! Create rewarding moments on the way to achieving your goals to keep you motivated and proud of what you are doing. And be sure to share your good news with your friends and followers. Make the reward proportionate and related to the goal you have accomplished. So if you’ve just made your first sale, spending the proceeds on an expensive meal might not be the best way to go. Instead, try buying tickets to an industry event, that way you can build relationships which may lead to partnerships for your business and you also get in that well-deserved glass of prosecco to celebrate. Perfectionism—we are all guilty of it. You’re looking at a header title and scrolling through the different fonts for hours until your eyes hurt because it’s not “quite right”. Timeboxing involves allocating a certain period of time for each task by setting yourself a timer. For example, you could designate 15 minutes to choosing the right font for your main text and 30 minutes on finding a great template. Try using one of our most popular templates or website shortcuts to save time. If after 15 minutes of browsing you still haven’t decided on a font, just pick your favorite so far and trying living with it for a little while—you can always return for another 15 minutes of browsing at a later time. If you’re always on the go there are a multitude of apps to help, such as toggl or focus booster that tracks how much time you spend on each task and will help improve your productivity. Keep in mind you can always add details after the website is live—in fact, websites should be constantly updated and changed. Allocating timeboxes or deadlines (like finishing the “About me” section by Tuesday), will stop you getting lost in the details and keep everything moving forward. The next cycle you can always polish the details. Think of what is important and what you have to be aware of for your website. All you really need is a simple structure using one of our suggested layouts with a “Home”, “About”, “Product”, “Gallery”, “Contact” section. We give you the structure and the layout, so you can just focus on the content! Simplicity looks better than an overcrowded website, so don’t think you have to use every element available to make your website look good. Eric Ries defines this term in his blog “Startup Lessons Learned”: “A minimum viable product is that version of a new product which allows a team to collect the maximum amount of validated learning about customers with the least effort.” The goal of using a MVP is to learn and test your business hypotheses. This way you can gather information on whether there is interest in your product and find out more about the customer. Ask yourself if you have a MVP. Does your website look good enough to achieve its purpose? If the answer is yes, consider going live with your website. Remember there is no such thing as a perfect finished website that will stay the same. Trends change and so will your website. Do the best you can with the knowledge you have and what you are able to do at this time. When it’s been a stressful week, it’s easy to let all of your well-intentioned plans fall by the wayside. An online calendar is essential to keep you on track for those website goals. Put in your weekly schedule then look at what gaps you have left for other activities. Calendar slots for setting up your website can just be for 10 minutes, they don’t have to be two hours if you don’t have that time. Consistency is key to developing your website and creating a routine that you will stick to. Putting yourself out there can seem scary with so many opinions on the Internet but making your site public opens you up to an invaluable resource—objective feedback. Though the idea of feedback might be intimidating, it’s actually one of the best ways to improve your website. Start with showing your website to close friends and family to boost your confidence. Try asking specific questions so you get more constructive feedback like “were you able to read the text clearly with the new background image?” instead of asking “How do you like my website”, to which everyone will say “it’s great!” A good idea is to ask “testers” to achieve certain tasks, for example, ask them: “Can you try to purchase something on my website and see if there are any steps that are unclear?” This way you can gather insight into different areas of your website. Then start widening the circle—ask some regular customers who you have a relationship with to check out your site and let you know what they think. You don’t have to advertise your website on every social media platform, just get that feedback on what to change, or hear what viewers love about your website! It’s important to follow your own idea but also take the opportunity to get input from others. 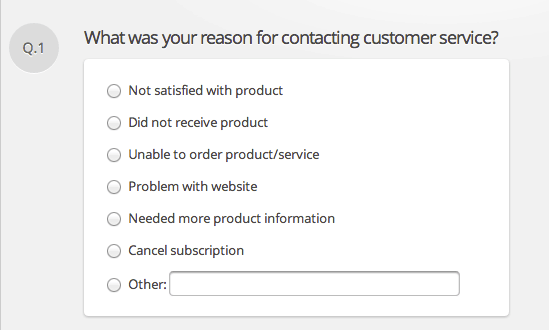 Another idea is to put together a customer survey. We like Polldaddy, Qualtrics or Google Forms as they are easy-to-use tools that you can use to incorporate a survey to your website. You can either include it on your checkout page as a popup that appears or in the order confirmation email. An alternative, if you have a new site, would be to put a little message on your homepage, in your footer, or even in a blog post, that says something like “Welcome to my new site! I’d love to hear what you think. That way visitors know the site is new (and adjust their expectations accordingly) and they know you are open to their feedback. Ask for help from those around you with elements that aren’t your strong suit. If you are good at writing but not great with images, get someone in your network to help you with graphics. Write down your obstacles in detail and share these with someone you trust to get a different perspective on how to resolve them. If you’re still having doubts, think about what you are really afraid of and whether it is realistic, then question your perception. Is it bad feedback? Think of it as a learning experience. Fear of the unknown? Have confidence in yourself and others. The only way to test the waters is to jump right in and get started. Finally, consider what you will you lose compared to what you gain from putting yourself out there. The worst thing that can happen if people don’t like your website is you just change it. The most rewarding moments come from accomplishing something outside your comfort zone! Any other techniques that you’ve found helpful with your own website? Let us know in the comments section!